Your feet are the foundation that supports your entire body while standing, walking, and running. Each foot has 3 arches that help you move gracefully with maximum efficiency. The arch on the inside of your foot is the most prominent one. You also have an arch on the outside of your foot and another across the balls of your foot. Wearing proper footwear to support your foot arches are of paramount importance in absorbing forces generated each time your feet hit the ground. Corns: They are hardened areas of dead skin formed over a bony prominence. They can be very painful when pressure is applied directly on them. Wearing shoes that are too loose or that put increased pressure on certain areas of the foot can make you susceptible to developing corns. Ingrown Toenails: Shoes that are extremely narrow in the toe region cause the edges of the toenail to dig into your skin resulting in pain and infection. Athlete's Foot: Tight-fitting socks and shoes can cause infection of the soft tissues, particularly in damp and sweaty areas between the toes resulting in inflammation, itching, and flaking of skin. Collapsed Arches: Footwear that does not provide arch support will cause your arches to collapse and flatten out eventually. This can lead to strain of the ligaments that support the arch and pain in the heel and arch area. Knee Pain: Improper footwear can cause imbalance of forces acting on the knee during walking and running resulting in degenerative changes in the knee. Lower Back Pain: Prolonged use of high-heeled shoes tends to cause postural changes that overwork the muscles of the lumbar region resulting in lower back pain. No Support: Being super flat, flip-flops provide no arch support, no shock absorption, and no heel cushioning. This results in wear and tear of the joints of the foot, ankle, and knee. Increased Exposure to Infections: Wearing flip flops in public can leave you open to a quite a few infections such as athlete’s foot, HPV, and warts. Increased Risk of Injury: You have to scrunch your toes while walking to keep your flip flops from slipping off your foot. This alters your biomechanics and increases the risk of injuring your foot and ankle when trying to move fast. 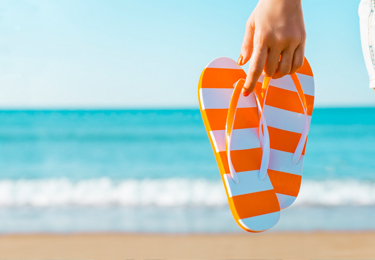 Hence, avoiding flip flops in favor of footwear with good arch support should be an important consideration in treating foot pain and developing a healthy gait pattern.